3. Tips to make promo video? What's it? And Why it's Important? As per few analysis made by Udemy experts recently, it was observed that when students watch promo videos on websites then they are more likely to make their minds to join courses with Udemy.com. A good promo video has ability to get 5 times more students for courses whereas if your video is able to attract more number of users with its awesomeness then the multiplier factor can vary up to 10 times. Actually promo videos help students to initiate their conversations with Udemy experts and it naturally brings more students to this online platform. So it is really important to create an interesting promo video related to your course material that can reflect your skills and knowledge in best possible manner. It helps students to get some idea about trainer’s teaching style, course goals and course topics, and if your technique is impressive then more students will prefer to join your class. Tips and Steps to make Good Promo Video for Udemy? Step 1.You must start with a slide that represents your course image. Step 2.Now you have to provide introduction to your course and let students know that why they must choose you as their instructor. Step 3.It is time to describe few potential benefits of your course. They must come to understand that what they will gain after completing the course under your guidance. Step 4.After this you need to enlist the major topics of your course that you will cover during complete course session. It will help learners know about major components of training material. Step 5.Provide your definition of an ideal student, let the listeners know about what kind of students you are looking for. Step 6.At last you have to include the call of action to all listeners so that they can make decision to join your course. Tools for Making Good Promo Video? Camtasia is well known as remarkable powerful video stream editor software program that makes editing task much easier with its simple platform and user friendly interface. It comes with the drag and drop feature so that every process can be completed faster. 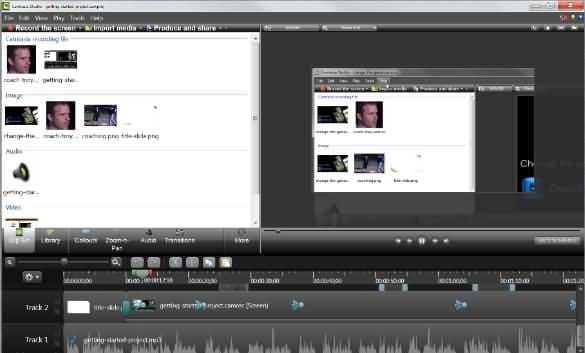 Camtasia can be easily processed by beginners as well as professionals. Just a three step process is enough to create wonderful tutorials: Select your footage, perform editing and finally save your video at desired location. With this advanced screen recording tool users are able to make customizable selection of monitor so that only desired portion of screen can be recorded. It can capture video camera, audio from multiple channels, iOS device input and computer audio- all at a time and results in quality output. Using ScreenFlow software program, you can easily edit your video with additional images, music, text, animations and different transitions. It is much easier to create professional screen casts using ScreenFlow program and it also extends support to almost all popular file formats like M4V, MP4 and MOV etc. Users can directly publish their content on website using this software tool. Filmora is recommended by professionals for beginners as well as experts because it always results very high quality of videos with Full HD resolution. The specially created effect store will help you to access so many creative filters, effects and animation related elements so easily. And the best part is that numerous new collections are updated to this software platform every month. Prefer to download your free version of Filmora for Mac as well as Window device and if you want access to complete editing feature set then go for paid version of this software.